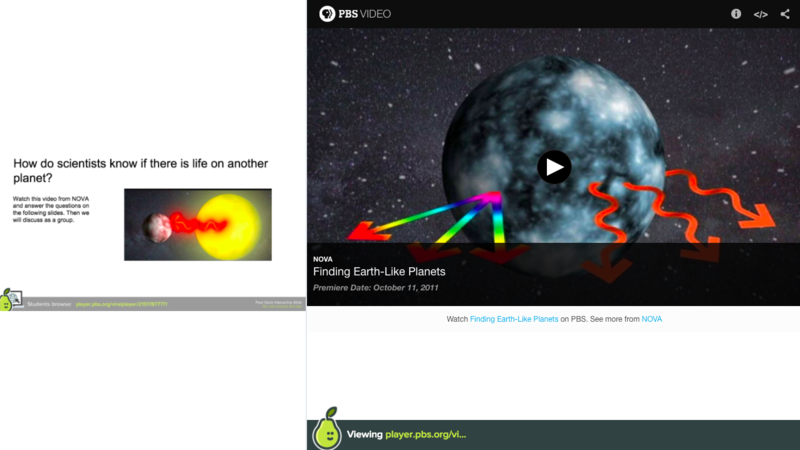 When you have another site or app you want students to explore, embed it into your Pear Deck activity! 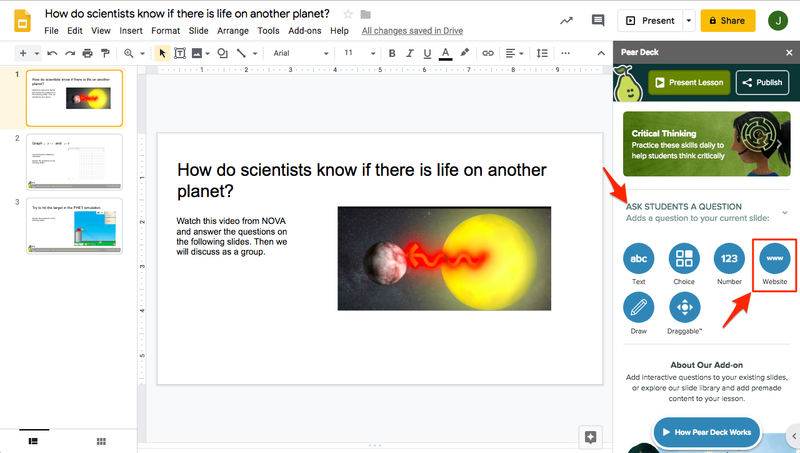 When you present a Session, students will be able to interact with the website without ever leaving your Pear Deck presentation. When you want students to come back together, you can lock their screens or advance to the next slide. Please note: We can only embed sites that are secure (that is, they have https:// at the head of the URL) and embeddable. If you would like students to view a site that is not secure or not embeddable, you can still put the link into the slide, and students can click on the link to load it in a separate window. It's still an easy way to get students to the right website. The downside is they will need to click back to the Pear Deck tab when you are ready to move on with the Session. Open your Google Slides file. Then, open the Pear for Google Slides Add-on. Create a Web Slide. In the Pear Deck Side Bar, scroll down to the Ask Students a Question section, where you can create custom interactive slides. Click on Website. A window will pop open and prompt you for a web address. Find the web address. Sometimes, all you need is a website URL. Other times, you need an embed code or embed URL. 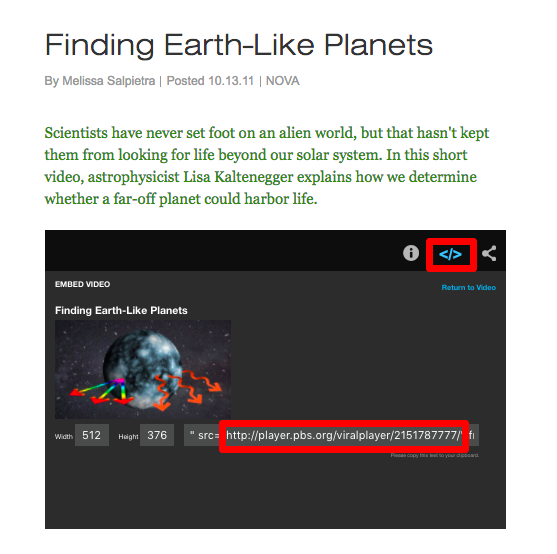 In this case, I wanted to embed a NOVA video for students to watch on their own screens. I went to NOVA and clicked on the embed icon </>. NOVA then shows me a whole embed code but all I need is the URL in the middle of. You'll see "src = https://player.pbs.org/viralplayer/2151787777/". Paste the URL into the Website Slide preview window. 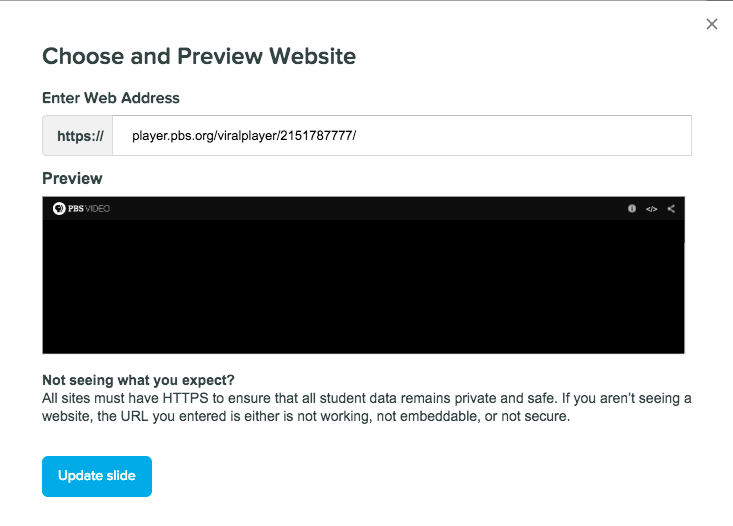 If the website is embedded properly, Pear Deck will show you a preview of the site. If the preview doesn't work, that means the web address cannot be embedded. Students will still get a link to it. Add Instructions. You can add instructions to the slide so students know what to do on the site you have embedded. You'll notice the Pear Deck bar at the bottom of the slide lets you know that when you are presenting, students will see the website you chose. Start Presenting. When you have all of your slides ready, go back to the top of the Pear Deck sidebar. Click on the green Present Lesson button. Let Students Explore. Students can navigate through the website you embedded from within the presentation. In this example they can watch the NOVA video. When you move to the next slide, their screens will move with yours. If you want students to work through additional slides at their own pace, this would be a great time to turn on Student-Paced Mode. 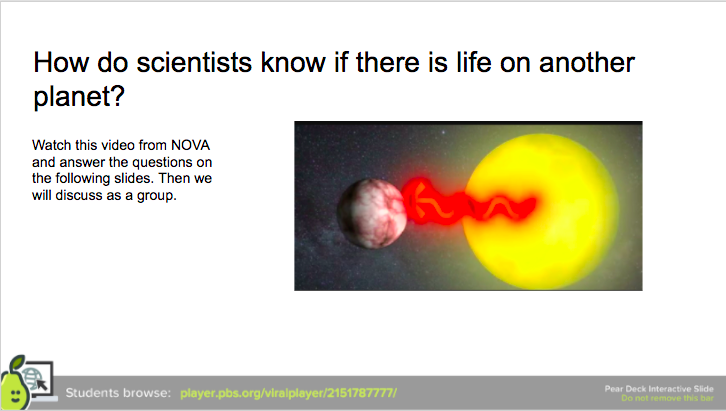 For example, you could let them answer a follow-up question on the next slide. Here are a couple other cool ideas for what you could embed. 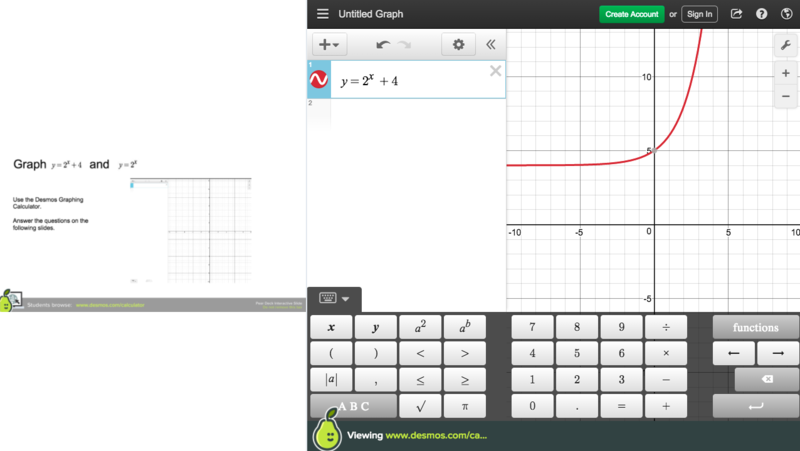 Desmos Graphing Calculator. Embed the graphing calculator and let students graph right from inside Pear Deck as part of your lesson. 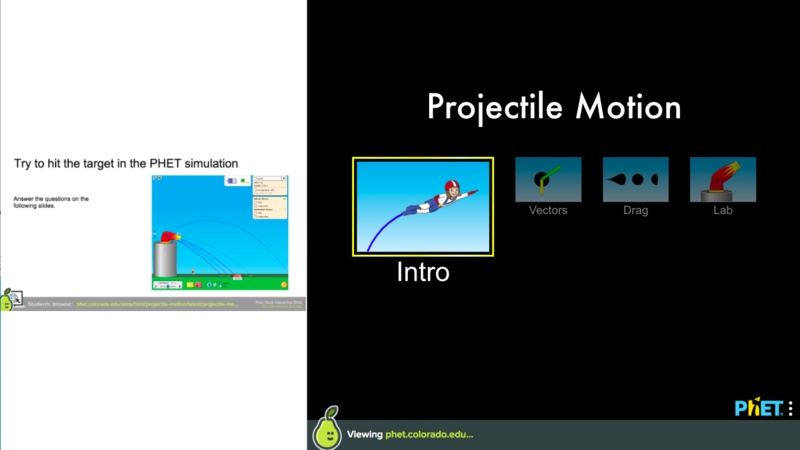 Phet Simulations. Embed a PHET Simulation and lets students explore. Ask a follow-up question by clicking the Ask a New Question button or turn on Student-Paced Mode to let them answer your pre-made questions on the following slides. What Sites Can I Embed in a Web Slide?